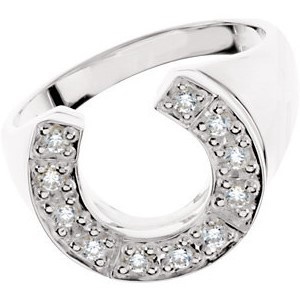 This men's diamond horseshoe ring is great for the horseman in your life. Sturdy and simple this ring is perfect for the man in your life that has the same love of horses that you do. This ring comes in a standard size 10. Also available in 14kt yellow gold. PICTURED AND PRICED HERE IN 14KT WHITE GOLD.